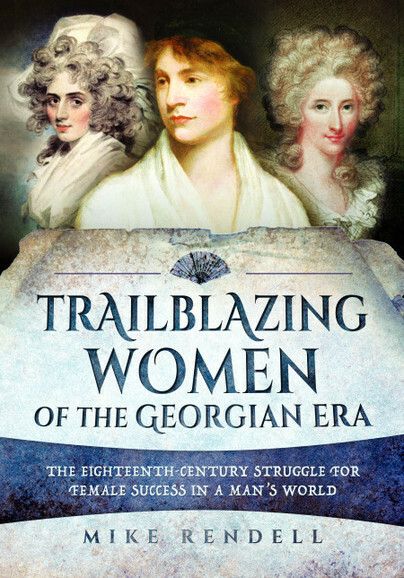 You'll be £14.99 closer to your next £10.00 credit when you purchase Trailblazing Women of the Georgian Era. What's this? Trailblazing Women of the Georgian Era offers a fascinating insight into the world of female inequality in the Eighteenth Century. It looks at the reasons for that inequality – the legal barriers, the lack of education, the prejudices and misconceptions held by men – and also examines the reluctance of women to compete on an equal footing. Why did so many women accept that ‘a woman’s place was in the home’? Using seventeen case studies of women who succeeded despite all the barriers and opposition, the author asks why, in the light of their success, so little progress was made in the Victorian era. Representing women from all walks of life; artists, business women, philanthropists, inventors and industrialists, the book examines the way that the Quaker movement, with its doctrine of equality between men and women, spawned so many successful businesses and helped propel women to the forefront. In the 225 years since the publication of Mary Wollstonecraft’s A Vindication of the Rights of Woman, questions remain as to why those noble ideas about equality were left to founder during the Victorian era? And why are there still so many areas where, for historical reasons, equality is still a mirage? Of the 17 female achievers Mike Rendell focuses on in Trailblazing Women of the Georgian Era, many are household names to people familiar with 18th century history: Fanny Burney, a novelist who laid the way for Jane Austen and others; Elizabeth Fry, prison reformer; Mary Wollstonecraft, pioneer feminist; Lady Mary Wortley Montagu, advocate of inoculation against smallpox. Others are much more obscure. I am thinking of Jane Marcet, writer of scientific books that inspired Michael Faraday; Sarah Guppy, inventor; Hester Pinney, lacemaker and stockbroker; Hester Bateman, silversmith; Mary Darly, print shop owner; Anna Fry, chocolatier. The achievements of all of these women were stunning when you consider the world they lived in. As the author explains in the introduction, the structure of society, its laws and customs, automatically put women in a deeply subordinate position to men. 'Coverture', for instance, by which a woman’s legal existence was ‘incorporated and consolidated’ into that of her husband meant that in law a married woman was effectively not a person. The custom of primogeniture ensured that women were usually effectively disinherited. Marriage law shackled women in violent and unhappy marriages; they were at risk of losing their children if they left. That women ran businesses, managed teams, influenced politicians, created, performed, gave birth, ran households and did a million other things should surprise no one. They have been doing so since the dawn of time. As Rendell is careful to explain, all the female achievers in the book had precursors and followers. Their work was often ‘painted over’ and forgotten, precisely because they were women. Perhaps what marks the Georgian era out is that despite the entrenched misogyny, legal disadvantage and reduced human rights that women faced things were beginning to shift. After all, an interval of just over 80 years separates the end of the Georgian era and the beginning of female suffrage. Even so, there remains, still, plenty more equality, of education and of recognition, to achieve. Rendell’s writing style is light and easy to read without being simplistic, and the chapters follow a formula in which the lives of the women are set in context, followed by a section looking at the impact each had on her field and the path she beat for other women. Interesting and lively. A good read. His neutral standpoint allows these 17 extraordinary women to speak for themselves. Rendell presents a clear picture of the expectations for women and the ways in which the women her choose expressed their individuality. The author has clearly done a lot of research when compiling the women for this book. Even though the sections were short, there was a lot of information included. It was good to see that some of the woman were based in Bristol which is local to me, and a city I visit often. I really enjoyed this book and it was a nice break between fiction. It definitely interested me, and appealed to me, as someone who is really into British history. I'd definitely recommend it! It just goes to show that women can do anything. An interesting look at the public role of women in the Georgian era, this book asks whether women were as unenterprising as has historically been thought. I learned about some women previously unheard of to me, and I thought the author wrote well and the book kept my interest. The author makes a good closing argument where he discusses the sidelining and the glossing over of the work of most women in history. I enjoyed the work, found it enlightening and easy to read. I would recommend it to others who want to know more about the Georgian Era, more about women's history and the ways they have circumvented conventions, and even those hoping to gain a greater understanding of various economic and business practices of the time period. I can even see this work being beneficial in literary and history classes focusing on the time period. The book itself has a conversational style, one I’ve noted with other books by Pen & Sword, and so it’s easy to fall into reading it. I read quite a lot of history books and most are so detailed they can feel overwhelming. This doesn’t and, as I said earlier, is a great introduction to the subject. This book was very informative and showcased how women from this era paved the way for the women's movement. This was a very interesting book. I learned so much -- some things I knew, some things I didn't know and some things I learned more about. I find this part of history interesting and incorporating well known women in history adds to the interest as well as understanding. People of the past truly do pave the way for the future and these trailblazing women of the Georgian Era are an example. Their hardship has led to today's equality, but it is not over yet and we have this book as a look at the past to help us improve the future.